To highlight how the body's breathing control system changes in low oxygen and how we respond to exercise. Exposure to hypoxia induces a definite change in ventilation. This change is also subject to adaptation over time if the exposure is chronic. The change in ventilation with exposure to hypoxia is commonly referred to as the hypoxic ventilatory response, (HVR) defined as the change in ventilation in relation to a change in % arterial oxygen saturation. We can measure the ventilatory response to hypoxia. This can be done at rest and while performing a specified exercise workload. We can measure ventilation, PCO2 and PO2 to show how in hypoxia we hyperventilate, and how these relate to carbon dioxide metabolism and regulation. 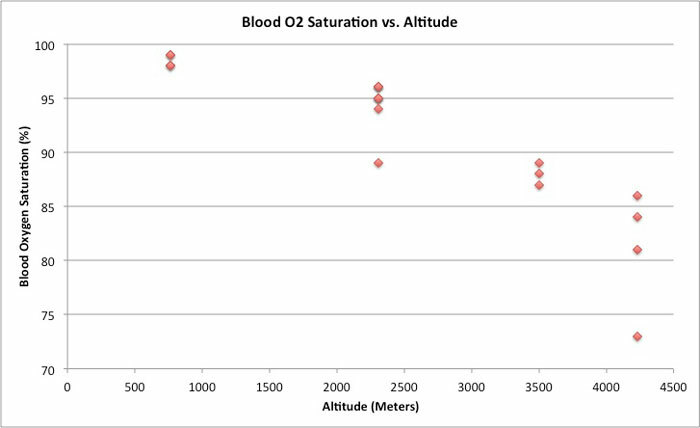 Although these results show a decrease in O2 saturation as the altitude increases, the capabilities of the Youth Ambassadors has increased considerably. When we first arrived at the Salar, most of the expedition members had headaches, and got tired almost instantly when exerting themselves. 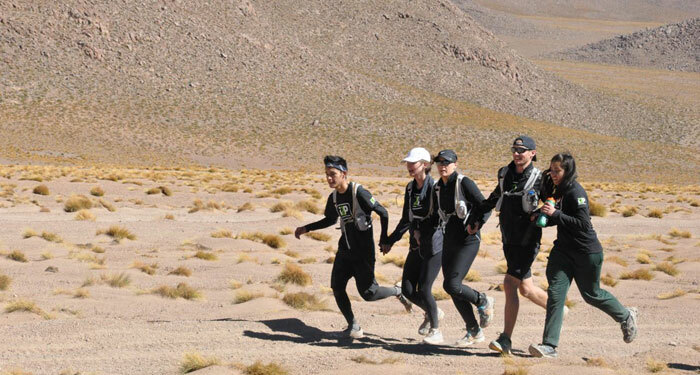 By then end of the expedition, at 4200 meters, the Youth Ambassadors were able to run, and had minimal negative effects. It's incredible how quickly the body adapts. Over lunch we decided to compare the results of our oxygen saturation and heart rate testing that we did on the Youth Ambassadors to the results that we obtained from separate testing on the entire expedition team. We were fortunate that our local guides who live at 3800 meters elevation agreed to participate in the testing. Here are the results of the comparison testing between the Youth Ambassadors and our local guides who have been living at altitude for their entire lives. 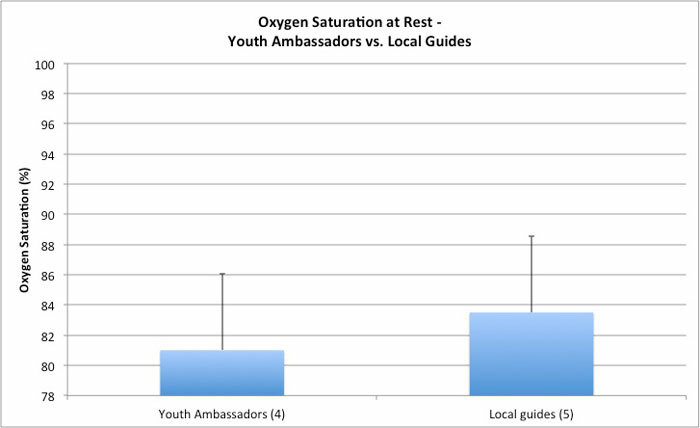 As you can see - the guides have slightly higher O2 saturations than the youth ambassadors, but only by about 2%. We also measured resting heart rate in both groups - and this is where the clear differences emerged. 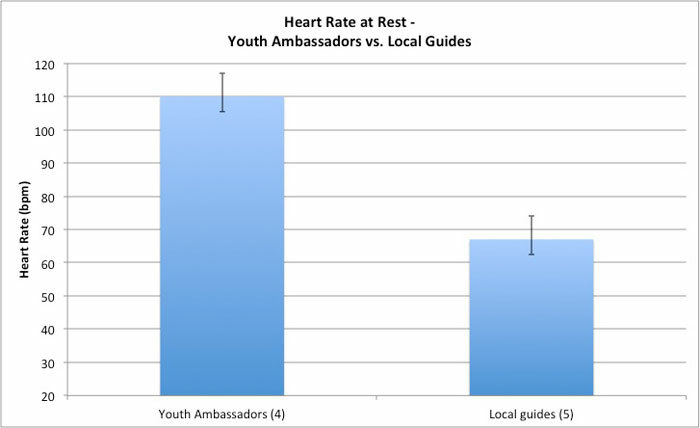 The youth ambassadors had much higher resting heart rates than the local guides. This means that there was a significant demand on the oxygen transport systems of the Youth Ambassadors to keep blood oxygen levels at reasonable levels. Interestingly, although their function was much improved in the week that we were here at altitude, clearly there are many other long term adaptations that happen if people spend months to years living in these extreme environments - as we can see in the low heart rates of our local guides.